January 19 marks a Russian Orthodox holy day. 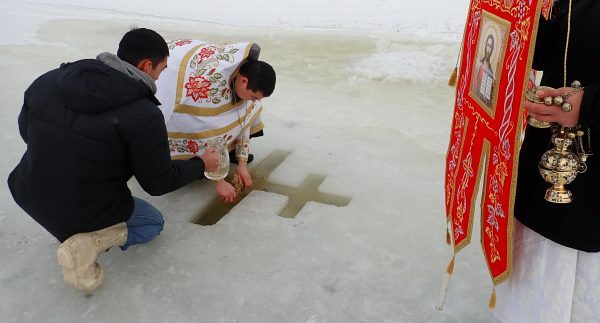 In Bethel, Russian Orthodox Christians commemorated the day by re-enacting the baptism of Jesus Christ on the frozen Kuskokwim River. About a dozen Russian Orthodox parishioners gathered in the St. Sophia Church overlooking Bethel’s Tundra Ridge. After singing hymns, parishioners pile into their cars and trucks and drive down to the banks of the frozen river. January 19 is Theophany on the Orthodox calendar, which marks the day Jesus Christ was baptized in the River Jordan by John the Baptist. On the Kuskokwim river, an Orthodox cross, with its distinctively slanted crossbeam, has been expertly chainsawed out of the ice. With bare hands, Father Trefon dips a gold cross into the frigid waters pooled in the cross’ cut-away and sprinkles the water to bless parishioners. Orthodox Christians believe this blessed water is sanctified holy water. The thermometer reads 9 degrees Fahrenheit, and the water can’t be much above freezing. If anyone is cold, nobody complains. But nobody dilly-dallies either. In other Christian traditions this holiday is also known as Epiphany. Trefon said his small church has around 70 regular parishioners, though many more in Bethel identify as adherents to the Russian Orthodox tradition. Regardless of a person’s belief system, it’s not hard to appreciate the connection between spiritual health and the icy cold, pristine waters drawn from a frozen Alaska river in dark, midwinter.